A lot has changed since my last news update, not least that we’ve now moved into our new home after many weeks of on-again-off-again, will-they-won’t-they accept our offer. 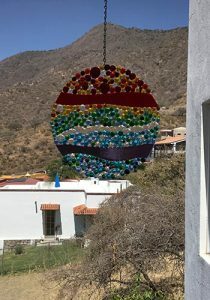 Finally, everything was completed, Jalisco style, just under three weeks ago – the same day that I woke up to my first Mexican cold and laryngitis. Which was fortunate because I’d just closed the previous evening in a Naked Stage production (not ‘naked’ literally, but a no-bells-and-whistles readers theatre). It was a relief to finally unpack numerous boxes that had remained sealed since we arrived – and great to be out of the rental. Although the house was okay and we’d leased through an agent, the owners were rather hostile when it came to providing general maintenance, and they usually refused. So, a certain finger gesture was genuinely warranted when we closed their front door for the last time. This photo doesn’t do justice to the luminosity of West Coast glass made by Gabriola’s Annie Holmes, which survived the journey and is now hanging in a stairway window. Appropriate that the ‘mountains meeting the sea’ should hang in sight of both the Mexican sierra and Lake Chapala below. Coincidentally, we travelled to Mexico on March 30, 2017, to stay with a good friend who’d retired here nearly 10 years ago. Ironically, our new house is just two streets above Linda’s home – although this was only one of several neighbourhoods on which we’d focused our property search. The house is 20 years old – built by Canadians who retired here, then became snowbirds three years ago when they bought a house back in Niagara and, finally, decided to return permanently. At this point it might be useful to provide some local geographical information and terminology. 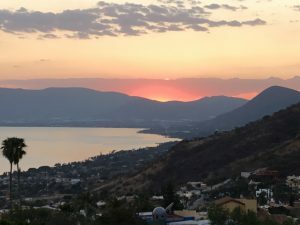 Running more or less parallel to the northern shore of Lake Chapala is the ‘Carretera’, or main road –a simple, two-lane highway. If you live south of the Carretera it’s referred to as Lakeside, while north is Mountainside. Typically, it’s the Mountainside communities that share the fabulous lake view. We are on the Mountainside of the Carretera, just east of the village of San Juan Cosalá (SJC). 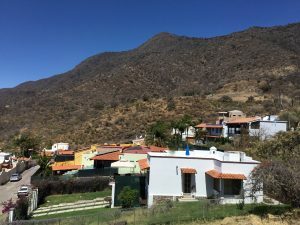 A larger town, Jocotepec (around 40,000 residents), less than 10 kilometres west of SJC, lies at the western tip of Lake Chapala, and saw its first Nahua settlers in 1361. The name – which has metamorphosed from ‘Xuxutepeque’ – has been interpreted as meaning ‘Hill of Guavas’. It’s an area abundant with fruit trees, including mango, lime, avocado, lemon and orange, as well as a major centre for soft-fruits – shipped to the USA and Canada by Driscolls – so the blueberries, raspberries and strawberries you buy in Costco could well have been picked less than five kilometres from us. Jocotepec also supports a large weaving and wool carpet industry as well as hand-made tiles and forged iron furniture. For centuries, ‘Xuxutepeque’ had been a trading and ceremonial village, with a large temple dedicated to their God, Iztlacateotl. Then, in the early 1500s, the Spanish arrived, together with Franciscans who converted the natives, destroyed old indian temples and laid the foundations of catholic churches in their ruins! San Juan Cosalá, known originally as Cosalá by indigenous groups of Cutzatalan people, was also renamed by the Conquistadors. Chief Xitomatl, who had controlled the whole area until 1523, surrendered peacefully to the Spanish missionaries and was baptized with a new name, Juan Bautista de Cosalá – later becoming the patron saint of the village, which was henceforth known as San Juan Cosalá. Located between the mountains and the lake, SJC has a natural geyser and several thermal springs – including the Raquet Club, where our home is located… And try getting cold water out of our taps at certain times of the day!!!? All the swimming pools in the community are fed by water from the hot springs – which can be both a blessing and a curse! Great if you simply want to float around and enjoy the view – a little warm for swimming laps. But, we can live with it!!! The great benefit is that the water is 100% potable and full of healthy minerals. 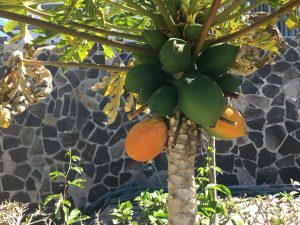 A bonus is that our new garden boasts a papaya tree that is right now loaded with fruit – surprisingly so given its diminutive size. Who can complain when tropical fruit is on the breakfast menu – and delicious it is, too. Mexico is definitely an ‘hola’ society. Rarely do you walk down the street without everyone offering a greeting: ‘hola’, ‘buenos dias/tardes’ or, even, ‘adios’. The latter might seem a little bizarre when someone’s approaching rather than already passed, until you remember that ‘adios’ actually means ‘go with God’… And Mexico is a Catholic country! However, foreign-isms are also creeping into the local vocabulary as regularly store assistants will say ‘buen dia’ – a short version of ‘have a nice day’. I’m sure there’ll be more to come on language – its barriers, idiosyncracies and humour – as our Spanish improves and we converse with locals. So, today is a national holiday, Benito Juarez day, to celebrate a 19th century president and statesman who stood against French intervention in Mexico. Today, Juarez is remembered as a reformer dedicated to democracy, reducing the influence of the Catholic Church in Mexican politics, a campaigner for equal rights for indigenous people, and promoting the defense of national sovereignty. He became the 26th president of Mexico, holding office from January 15, 1858 to July 18, 1872. The period of his leadership is known as ‘La Reforma’ (the reform) in Mexican history, marking a political and social revolution that had major constitutional consequences. Yay! We’ll celebrate Benito Juarez day as representing philosophies many other countries would have done well to adopt. I already know that little things please little minds, but occasionally an unexpected accomplishment ascends to a higher plain… The laundry room in our new house has both a washer and dryer. Okay – seems quite normal. However, being an eco-friendly type of person, I’ve always chosen to dry ‘stuff’ outdoors, weather permitting. Ha ha!!! A few days ago, just after lunch, I hung out a basket-load of wet laundry on our clothes horse (do you remember those from bygone days – otherwise known as a ‘clothes airer’! ), which was undercover on our terrace. We then walked around the block with the dogs – gone for no longer than 15 or 20 minutes – and thanks to a warm breeze blowing down from the mountainside, every item of washing (even the underwear elastic) was bone dry! Why would anyone living here bother with a dryer? View from the west end of our terrace looking back at the Sierra de San Juan Cosalá. The ridgeline rises to 8,000′ and runs for around 30 kilometres. Great dog-walking country. 13 Comments on News update without waiting several months…!!! Lovely to see your new view and yes the glass art by Annie looks like it was born to be there. Oh Jean, what a lovely view you have found. Good on you both! Thanks for tuning me in. I hope we can get there at some point to say “Hi” and enjoy some of what you have found to make your life complete. more later, Annie the artist. Well this all sounds just lovely! Good thing the sun is shining here right now or I might just get depressed! Hope we get some pics of your house as well as the view. Glad it all worked out after all the hassle. Lovely! Thanks for the update. Glad everything worked out finally. Looks like a beautiful new place. Can’t wait to see photos of your home. Hi Jean and Peter…good to hear from you . Loved the history part and am so sorry I didn’t get to your house and little village….next time for sure..Victoria, lovely and sunny, cherry blossoms in bloom, but still a bit cool. Lovely news Jean as always and marked with historical background. I experience the teacher in you. Happy you two are happy. Love to read what’s going on – enjoy it! Wonderful to hear how you have settled in so well. Sounds marvellous, looks marvellous. Yes, a tad envious, I must say. As we sit in drifts of snow up here, wondering if winter will ever end. Hope to see you some time, perhaps when you come up for the Masters. Am no longer needed by them, but we can always get together in the off-hours. Meantime, all the best. Hola! Adios!